> An Animation short video. 3 minutes, loop, sound. > This work is made in 2 versions: one video channel & 36 video channels. > The work is a cultural vision of the Arab spring‫.‬ It's about the question whether this movement will bring freedom or not. "You are to suffer, to carry your burden and the weight of your existence on your back forever. And on this rough road you are to travel. You walk, with blackness round your eyes blocking your entire vision, and a hole in your head preventing you from knowing. You are not to learn, to see or to understand. this is your fate and this is how you are destined to exist. Note 1: We are all Sisyphus. Note 2: Sisyphus, at this moment, has the face and the tongue of an Arab. Note 3: Sisyphus can go on a demonstration and cry out loud against his destiny." 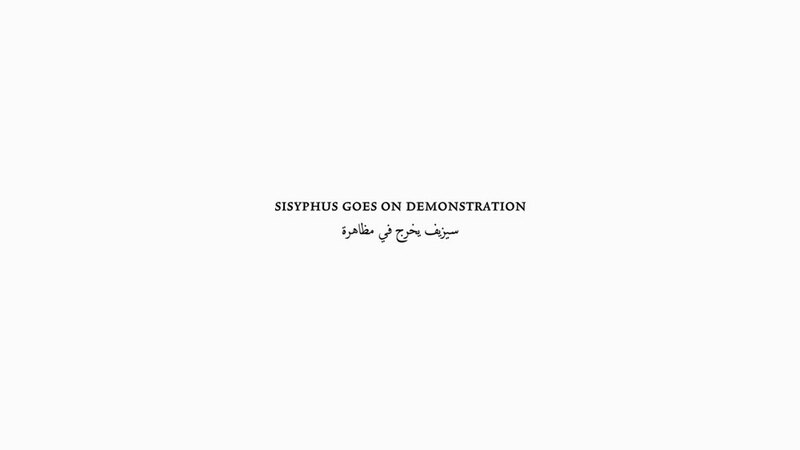 > Sisyphus Goes on Demonstration, the 1 channel vision, 2012, 3 minutes, loop, sound. > selected still from Sisyphus Goes on Demonstration, the 1 channel vision, 2012, 3 minutes, loop, sound. > selected still from Sisyphus Goes on Demonstration, the 30 channel vision, 2012, 3 minutes, loop, sound.